The National Bureau for Defending Land and Resisting Settlements in its latest weekly report said that the Israeli Knesset elections came to an end, and the Israeli PM Netanyahu has done his best to remain in power using all possible means including his success to normalize relationship with some Arab countries, and raising the slogan of “borderless settlement”, in which many of ministers, including Moshe Kahlon, head of the Kolano party, and Minister of Construction and Settlement, who has declared that the construction freeze in the settlements of the West Bank is over and will not return as long as we exist and that the construction will not be limited to the settlement blocs, but will extend outside those blocs to the illegal outposts, while the leader of the “new right” party, extremist, Naftali Bent, announced as the Israel’s general election is taking place on April 9th, the party support the right to abort the establishment of a Palestinian state. Israeli Justice Minister, Elit Shaked stressed that her new right-wing party, supports the annexation of Area C in the West Bank to Israel. At the height of his campaign, Netanyahu made his statements saying that he is expected to receive in his second term a decision by US President, Trump to recognize Israel’s sovereignty over the West Bank. He made it clear to the American president that he was not prepared to evacuate any settlers or settlement blocs, but must remain under Israeli sovereignty and committed himself not to uprooting of any settler, and to control of the area west of the Jordan River; and the non-division of Jerusalem and that he will not retreat on that. 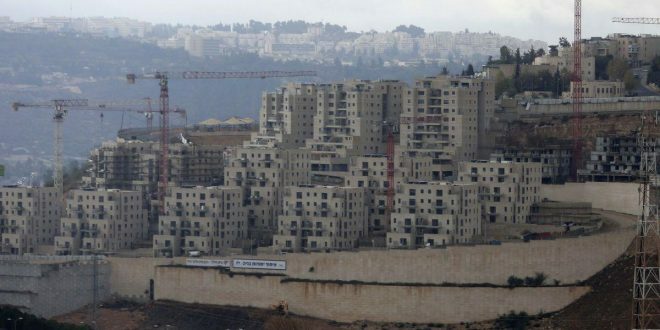 Thus, the Ministry of Housing and Construction in the State of Israel recently announced a tender for the construction of hundreds of housing units in the West Bank according to a plan that includes 62 units in Adam settlement near the village of Hizma, 112 units in the settlement of “Alfei Mansheh” near Qalqilia. The new tender also includes the construction of 195 units in the Ariel settlement, 50 units in the Ammoniel settlement near Salfit, 44 units in the Ma’ale Efraim settlement in Shva al-Gore, and 14 units at the Betar Illit settlement in Pisgat Zeev, and the establishment of bypass road number 4, which runs from Ramat Shlomo to “Atarot” to the main road between Tel Aviv and Jerusalem “Modi’in No. 443”. It was disclosed that, the Elad Settlement Organization that is active in the Judaizing the occupied Jerusalem and purchasing real estate on the “forest of peace” in the city of Jerusalem with the collusion of the authorities and the municipality of the occupation. For the benefit of the settlements. The Forest of Peace is about ​​550 dunums between the neighborhood of “Abu Tor” and the settlement “Armon Hantsev” was turned over by the Elad Association in the past 14 years into a center of wide tourism attraction after it illegally seized. The Israeli occupation authorities colluded with the settlers to cover up their crimes and encourage them to carry out more crimes, the last of which was a settler helping other settlers and executed Moh’d Abdel Fattah from Kherbet Qais in Salfit in cold blood, besides injuring Khaled Rawajba from the town of Rojib, while Hebrew sources revealed that the extremist settler who participated in the killing of the family of Dawabsha in Douma in Nablus at the end of July 2015 will reach a deal through his defense team with the Israeli Prosecution by issuing a reduced indictment against him in return for admitting his involvement in the murder of the family. The original indictment was attributed against the five settlers, crimes of intentional racially motivated and racist property destruction. The settler accused of killing Aisha al-Rabi, near Nablus, for months, testified before the Central Court in Jerusalem to try to acquit himself by making false claims of throwing a stone rock against the martyr Rabi. It is clear that we have entered a stage in which the vast majority of settlement outposts will be whitewashed within a short period of time. Settlements will be formally considered by the Israeli government. According to the recommendations of the Zandberg Committee, it is expected to legitimize 99 % of the unauthorized outposts retroactively within two or three years. An unlicensed outpost that has yet to be established will join some 30 outposts that have already been legitimized and about 7,000 illegal buildings in settlements and outposts.